HOPE DEALER In Amishland: What Are You Expecting? This past weekend I had a great time hang'in with my family. 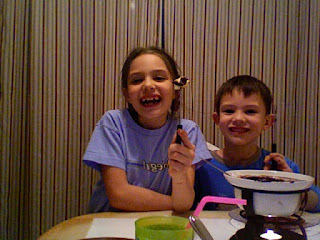 We spent one of our nights enjoying a meal together, playing uno and downing some serious chocolate fondu. My kids were incredibly silly that night and it was great moment together. Unfortunately, my wife and I ceased to realize that filling our kids with sugar at 8 p.m. would hinder their ability to be quiet. It would hinder their ability to eventually go to sleep as we had expected. As we played uno we kept trying to get our kids to 'settle down.' What were we thinking? What were we expecting? We were expecting the opposite of what we should have based on what we gave them. We do that in our lives all of the time. We believe God to do great things, but often times we don't always fill our lives with the rights things. We need to fill our hearts with faith and good things from God's word. I want to challenge you to fill yourself with the right things this week. Fill yourself with God's word and allow faith to rise up in your heart. When you do that you will no longer just believe, but you will begin to expect the good things that God has in store for you!